Back when I was in public school we did Oliver! once, I really wished I would have tried out but I was in Grade 5 and very shy. Both Olivers and Dodger were all girls but had shorter hair so it was okay. I think they would be better than any of the boys at my school, we really didn't have that many boys who were good singers/actors or any that committed even. Oh yes. I'm sure they had masculine facial features too. Because short hair automatically makes it okay. A male can grow out longer hair but he won't have feminine facial features. Does that make it okay? Definitely. The version I did, Oliver was double cast, one boy and one girl. It works if she's young enough and doesn't look overly feminine. I actually had a bunch of people say they thought she was a boy. And she only had to cut her hair a bit, just chin length. In addition, all of our orphans/pickpockets were girls except one. In this life, one thing counts: in the bank, large amounts. I\''\''m afraid these don\''\''t grow on trees, you\''\''ve got to pick a pocket or two. Taming Of the Shrew: \"Katerina\"
As a director I would only cast young girls into the ensemble. Surely, talented ones would try out. But it's not historically correct to say that boys and girls were in English workhouses together. The time period the show takes place in is so blatant and Dickensian I can't see any way I could tarnish that. If some people honestly mistook your female Oliver for a girl I applaud. The thing is, so often that doesn't happen and "gender bending" is not taken seriously and is instead made a joke. I've seen instances were an actress didn't even try to come across convincingly male. The thing is, so often that doesn't happen and "gender bending" is not taken seriously and is instead made a joke. I've seen instances were an actress didn't even try to come across convincingly male. Yeah, changing the script at all is a breach of contract, in addition to just being extremely tacky. My daughter was just cast as one of Fagin's gang in a local production. The casting notice said that "We strongly prefer to cast boys in the child roles, but we will consider girls if they can legitimately play as boys." I thought that was a good way of handling it: they would ideally PREFER to cast a boy, but they're also leaving their options open in case no really talented boys try out but there's an amazing girl auditioning. My daughter got a callback for Oliver, and was told to wear her hair pulled back or under a hat and dress as much like a boy as possible. That's the best way they could have handled it. A question like this is always tricky, but in my opinion, if the production is by an actual theatre company, they should try and cast it as authentically as possible. The problem with doing Oliver! in schools is that very often, girls are typically much more open to auditioning and performing in musicals than boys. Therefore, you get more girls willing to perform in a musical that is mainly centered around boys. So what do you do with the extra girls? If the girls can pull it off, i think they should be allowed to play boys, if the director can find no alternative. But why produce a show you know you're not going to have the resources to do? Do a show like Annie or Little Women instead. 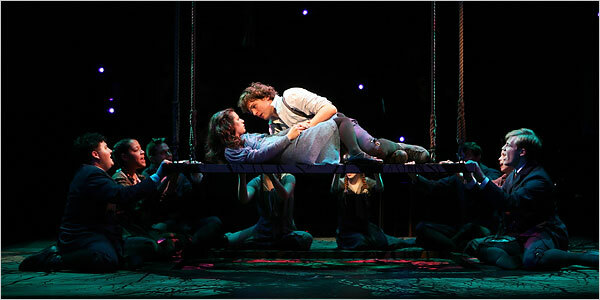 It doesn't matter if a show is produced on Broadway or at a high school. It should still be of the highest quality and truth to the story as it can. And community theatre groups should know their community and talent pool well enough to predict if they will have enough young men audition for a production. It's poor planning to select shows that may not suit your auditionees. Isn't it selling short the many young girls who will try out? Do a show that can actually use them well. And on the other side of the coin, let's say one of the girls' little brother, or another young male in the community (that word again) comes to see the show. What message is being communicated? Theatre isn't something guys do. That's what I imagine a boy would take from seeing a girl play a boy his own age. I don't think that's a very good thing. The theater doing the production that my daughter is in isn't a community theatre; it's an Equity Showcase theatre that's allowed to use both Equity and non-union actors. They get Equity actors taking the train in from Manhattan to audition. So they're not limited to the local community. They've never done a show with kids before, or at least not in a very long time (I've been checking their casting notices for the past three years in vain looking for something my daughter could audition for), so they don't have a specific, limited pool of actors that they "know" will audition. This is probably something of an experiment for them. I'd imagine that if ONLY girls had showed up for the auditions, they'd decide not to do boy-centric plays in future. But as it turned out, a fairly even mixture of boys and girls auditioned. I know Dodger's definitely going to be a boy, because only boys got callbacks for that role. I'll post what Oliver turns out to be when they send out the cast list.